How do Gai's Gates work? when Lee fights Gaara, Kakashi says that as you open more Gates, the risk of death rises. Well, when Guy fights Kisame, Guy has already opened several Gates (up to 6) before the final attack, and they have been open for quite a lot of time (relatively) before the seventh Gate is opened. And of course as he opens more Gates, with his stamina rate supposedly decreasing exponentially, I'm pretty sure he was supposed to be "pretty exhausted". But still, when he opened the seventh Gate, he still had enough time to talk and stop Kisame from escaping. Shouldn't this be too much for him? No, you're not quite right about it. There are eight gates at total. Each gate is a special point in the body that limits the flow of chakra. This is done in order for the body to live longer (more chakra flowing = the body is expiring faster). Opening a gate lets chakra flow freely through it, giving the shinobi a boost in his powers, but as a price his body is suffering from that power greatly. Each gate gives a boost in a special power, e.g. the first gate removes the restrains on the muscles, the second improves physical strength and re-energizes the body, and so on. Now, opening the gates is very dangerous by itself, and it's becoming more dangerous the more gates you open, that's right. The reason for that is that the body simply can't stand the chakra, and gets damaged by it. That's why it's hard to open the gates, and it requires a lot of training to use them. Guy has gone through a lot of training to learn to use that much gates though. and finally the last, 8th gate gives the user some tremendous power, but costs him his life. So, to summarize: since Guy has gone through a lot of training to learn to open the gates and use their power, he can use them in the battle. Of course, there are side-effects, even for him, but they usually happen after the battle when he closes the gates once again. Nevertheless, opening the last gate would cost him (or anyone else, for that matter) his life. source: Naruto Wikia - Eight Gates. Kisame uses water prison and kills himself. 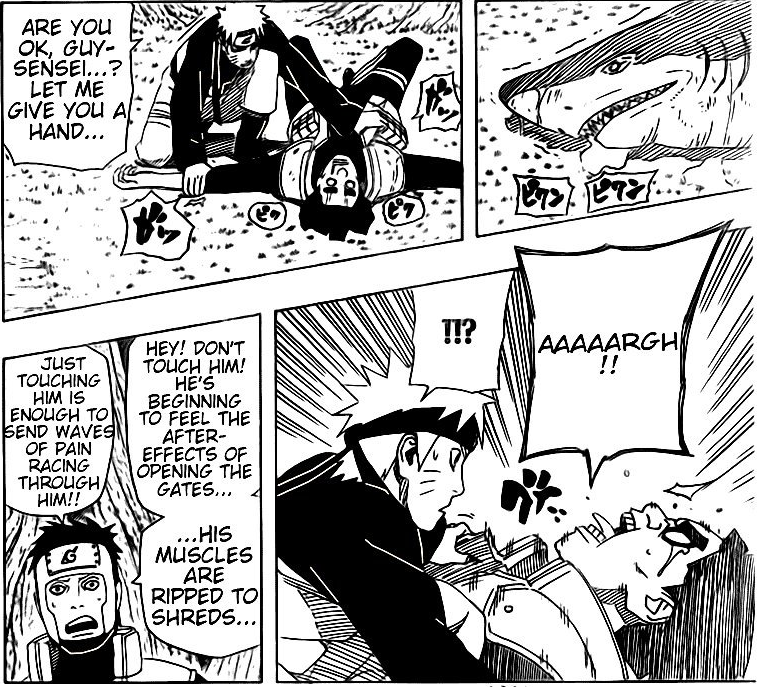 No, although opening the six and seventh gate is extremely dangerous, Guy Sensei has gone through extensive training as can be seen whenever he makes an appearance, he's almost always pushing himself to his limits which allows him to withstand the effects of the eight gates and use the technique with minor repercussions. Each Gate requires immense Physical strength, this is why Lee and Gai train their body without using chakra but using weights, punching logs/trees. This training increases the strength of their bones and muscle so when they do open the gates the limit release that comes with the increase chakra does not rip them apart. Every gate once opens releases a restrain in the physical body along with immense chakra. Any ninja besides Gai, Lee or the Raikage opening the gates would be rip apart because instead of using 10-30% of there max muscle/bones they are using 100% thus breaking. Tsunade/Sakura power comes from perfect chakra control not actual physical training this is why Sakura goes from being not able to lift anything at 12 years old to breaking dozens of meters of ground in just 2 years. The difference in this is that Gai and lee posses more durability, defense, endurance, stamina, than both Tsunade and Sakura because they tain their body but they don't posses anywhere close to the amount of chakra control they do, no one in the series does. while it may seem like chakra strength vs physical training strength is no difference in reality it is, if Gai and lee run out of chakra they still posses their superhuman like physique to somehow get away, but if Sakura losses chakra/runs out she would become fodder and would be kill easily, because 100% of her power comes from chakra. If you read any Wuxia/Xinxia novel a physical refinement character using weights/gravity/water pressure can increase his strength in bones, muscle, flesh, organs to reach a degree where his skin is hard as diamond. No ninja in the series besides the Raikage has anywhere close to even having skin/bones as hard as a rock as majority of the ninja can be hurt by normal sharp kunais, there are ninjutsu that increases the body defenses like Kakuzu earth ninjutsu and sage mode but these are once again chakra depended, while the body is 24/7 on, requires no chakra and requires no energy to sustain besides food. Can the 8 Gates be Achieved by Anyone? How does Vanishing Rasengan work? How does Naruto's right arm work? How does the reincarnation thing work exactly?